Come to Pulau Ubin for authentic traditional wayang in celebration of Tua Pek Kong's birthday! 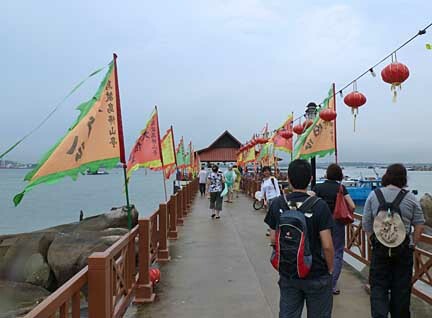 Ubin jetty is usually colourfully decorated for the celebrations! With free boat rides to between Changi Point Ferry Terminal and Pulau Ubin in the evenings! There will be a nightly wayang show (4-8 May) and finale geitai show (9 May). This is NOT a special performance put up for the public, but a part of the way of life of the residents of Ubin. Here is a chance to take part in a dying tradition. Take a bumboat to Pulau Ubin and enjoy what may be the last of these performances. You can also enjoy a sumptious dinner at the restaurants there before or while watching the show. 9 May (Wed), depart Changi 6-9.30pm, depart Ubin 6-11pm. Thanks to the alert by Alan of Ubin NParks. More on how to get to Pulau Ubin. More about these festivities on the Pulau Ubin stories blog and the ubin.sgkopi blog.